In a career that spanned sixty-five years and scores of parts as well as fourteen films, Mary Rorke was one of the sturdy mainstays of the London theater. She made her debut in 1873 and played her first Shakespeare part, Phoebe in As You Like It, the next year in 1874. Her roles in Shakespeare where intermittent; she next played Elizabeth of York with Richard Mansfield in Richard III in 1889. In 1896, having joined Sir Henry Irving‘s company, she again played in Richard III as the Duchess of York. In 1904 with Lewis Waller at the Imperial Theatre she played the Chorus in Henry V and then the Nurse in Romeo & Juliet. 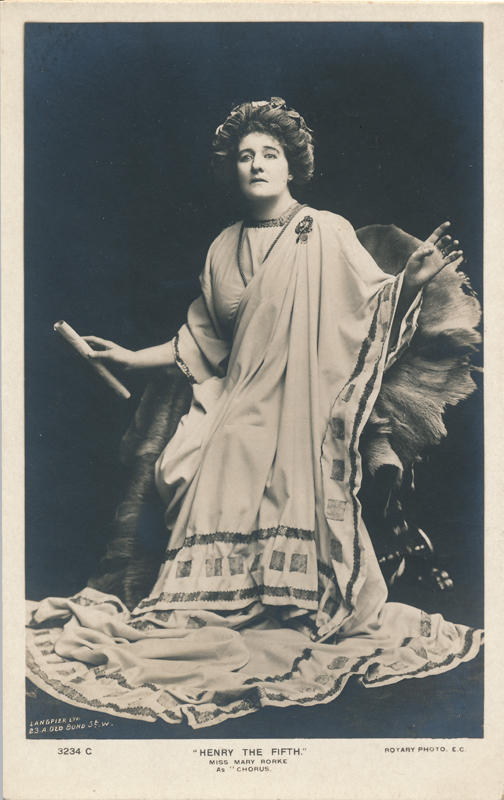 In 1907 she played Emilia in Othello with Oscar Asche as Othello and Lily Brayton as Desdemona; her last part in a Shakespeare play was in 1910 when she returned yet again to Richard III, this time as Queen Margaret. She last appeared on the stage in 1931 and made her final film in 1933, just five years before her death at eighty.